“Siddheshwari Devi, the doyen of Hindustani music is sitting on a chair, with a japa mala in her hand. 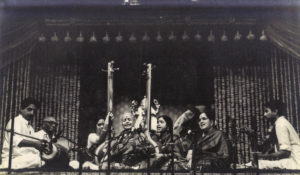 Seated in front of her, are M.S.Subbulakshmi and her daughter Radha Viswanathan.” R.K.Shriram Kumar, well-known carnatic violinist brings the scene from Kalki Gardens, MS’ home alive to the audience. In an intimate lecture-demonstration, from his unique vantage point as her accompanist and disciple, Shriram Kumar spoke of what made MS (whom he refers to as Amma) a truly special musician. The lec-dem was hosted by Dhwani, an organization based in Columbus, Ohio promoting the performing arts of India. 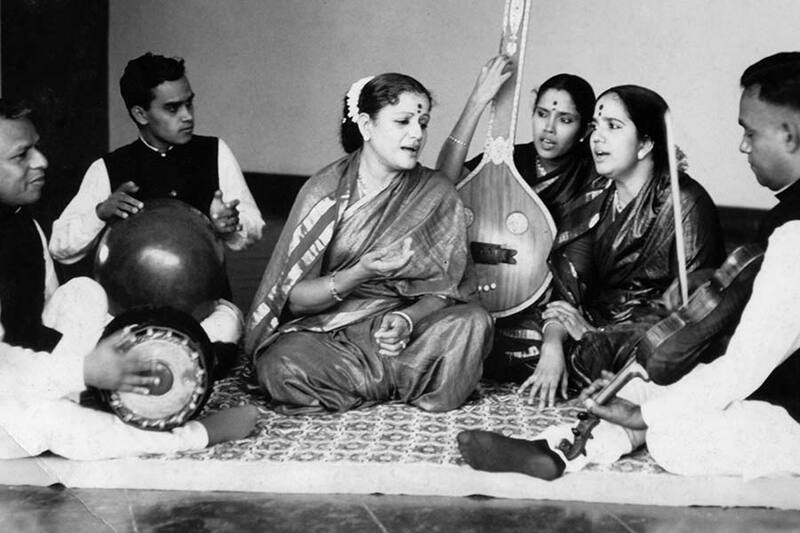 “Even at the peak of her career M.S.Subbulakshmi continued to learn from other musicians,” he points out. In this specific story he shared illustrations of both the daily practice of aakara sadhaka and constant learning that continued throughout her life. Much as she learned tumris from Siddheshwari Devi, M.S. had earlier learnt from other stalwarts such as Semmangudi Srinivasa Iyer, Musiri Subramanya Iyer, Papanasam Sivan amongst others, and sought out others such as my guru Seethalakshmi Venkatesan to learn devarnamas and Dilip Kumar Roy for bhajans. “She made the music her own, regardless of whom she learned from,” Shriram says, as he plays a recording of MS singing ‘Chethashri Balakrishnam’ along with veena vidwan K.S.Narayanaswamy. Even though she had learnt this song from Semmangudi Srinivasa Iyer, MS presented it in her own unique style. A notable feature of this distinct style was her use of kaarvai. Kaarvai refers to the singing of one note for an elongated period of time. To illustrate this he plays a recording of ‘Needhucharana’ the Tyagaraja composition in raga Kalyani. 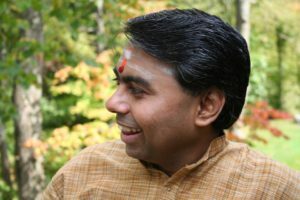 The effect of the kaarvai was to “envelop the entire audience and hold them spellbound.” He reiterated with multiple examples, how her voice was almost a third tanpura in total synch with the two tanpuras that accompanied her. “She never compromised on the Carnatic idiom,” Shriram asserts, as he plays a rendition of raga Kedaragowla by MS. “Everytime she presented a raga alapana, it was balanced and thoughtful. See how she presents the raga in three speeds.The brighas flow seamlessly and she never overdoes the gamakas. Amma always put the music front and center.” He points out this adherence to tradition did not keep MS from innovating – particularly in bringing music from around India and in some cases from around the world to the Carnatic stage. Most in the audience were unaware that she’d rendered songs in Japanese and Arabic. Shriram illustrates this by playing a recording of MS and Radha singing an invocation at the 6th Afro-Asian Congress of Ophthalmology in Chennai in January 1976. “She took great pain to delve into the meaning of the songs in a language that was unfamiliar to her” he says. “Understanding the pronunciation and meaning of the song lyrics was as important to her as the musical presentation,” he adds. He emphasizes how saahityam and sangitam both played an equal role in all her concerts. “Amma taught me the Shyama Shastry composition in raga Madhyamavati Paalintchu Kamakshi” Shriram begins. Within a week of learning the song, he had a live concert on the radio. “Though I’d practiced the song only a few times, I was determined to play it on the radio.” The audience could guess what was coming. In the middle of the live concert, Shriram found himself wondering if he should play a specific segment on the same string as other notes, to handle transitions seamlessly. “I just managed to handle it without messing it up” he says. “When I got back home after the program, there were two calls waiting for me. I’d never thought MS Amma would have listened to a mid-day radio concert on a little known FM station. My heart was in my mouth when I called her back.” She complimented him for having played well. She then asked him why he had ‘tweaked’ a sangati in the song. Shriram, accompanied by J.Vaidhyanathan on the mridangam and Jayanthi Prakash on the tanpura, concluded his presentation by playing Akhilandeshwari, the composition of Dikshithar in raga Dwijavanthi, in a manner that recreated the MS magic for all present.